One Glühwein, Two Glühwein, Three Glühwein, Lama! 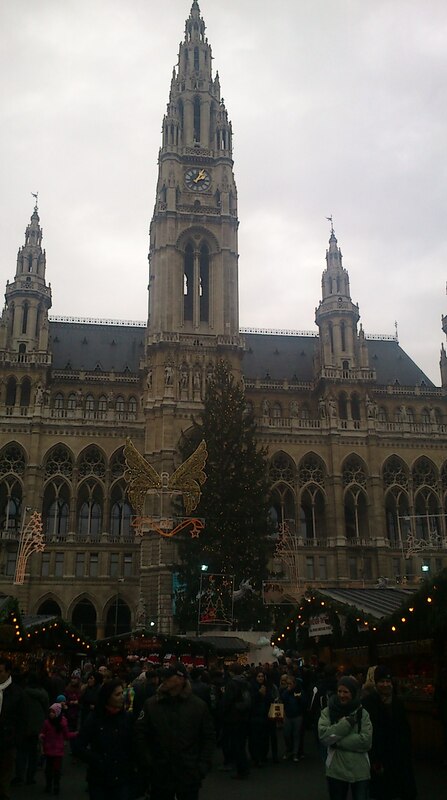 It’s my favourite time of year in Vienna. 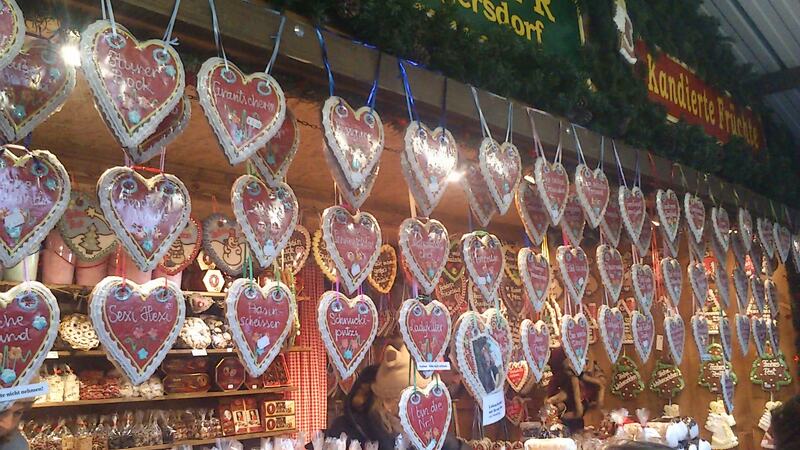 It is Christmas market time. It is actually the reason I moved to Vienna. I came here on holiday once at the beginning of December and instantly fell in love with the twinkly splendour of the city. 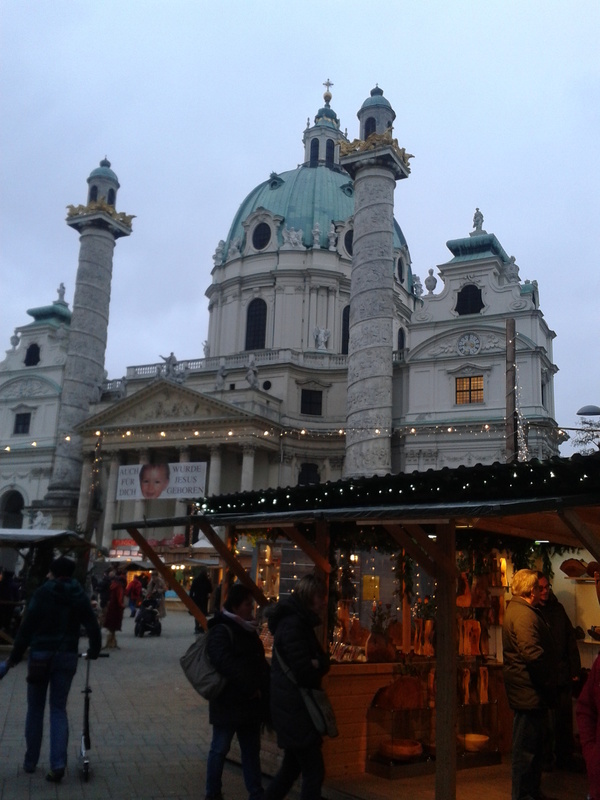 A handful of markets opened last weekend and the remainder open this weekend and so, seeing as they are the reason that this English girl is in Vienna, I thought a write up was in order. The locals I have spoken to all say that they totally avoid the market at the Rathaus, which is the biggest one and pulls the most tourists in, so it can get really busy, uncomfortably so at times. It is however, a very grand and lovely one with the biggest Christmas tree lit up amidst the back drop of the grandly gothic town hall building. 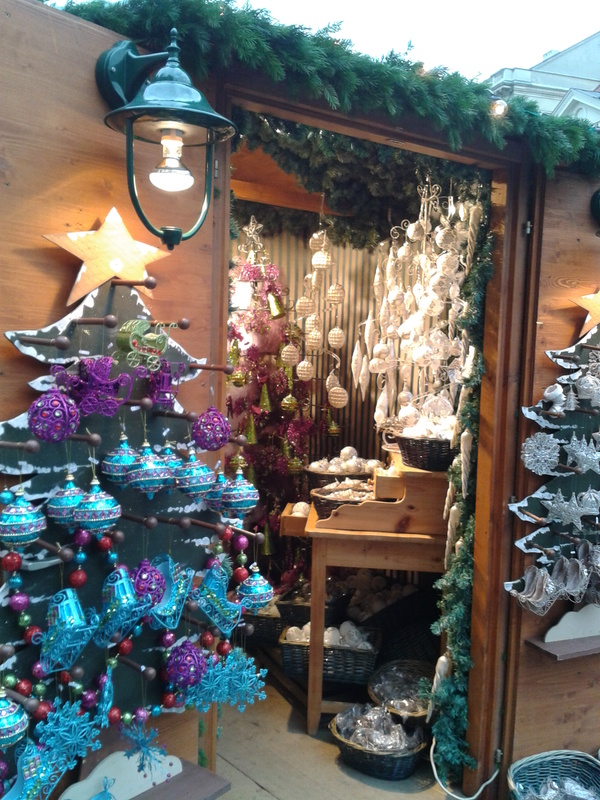 The Viennese complain that it is too commercial and sells rubbish, but if you want some lovely Christmas tree decorations, toys and sweets, sweets and more sweets then it is more than worth a visit. Be warned, it also has the most expensive Gluehwein. Coming in at four Euros a cup, it is a whole Euro more than at other markets. Last year the prices pretty much seemed to be uniform, but this year there is a noticeable difference in cost, although it has to be said, it definitely tastes good. Next we have the Spittelberg market which lines the small and charming lanes around Stiftgasse. It is small, but perfectly formed and has a very unique feel to it. 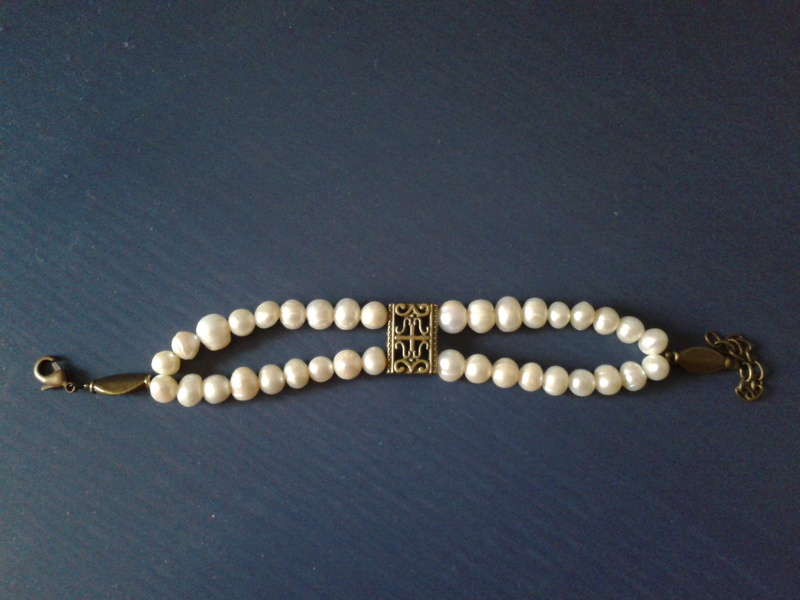 Most people agree it is best for buying jewellery, so it is a good place to buy a few presents. It also has great spaces under trees lit with fairy lights in which to enjoy a Gluehwein or Punsch. If you get too cold, there are also lots of bars and restaurants to shelter in and it has many covered areas in which to stand and have a drink in. It is very atmospheric, especially in the evenings. 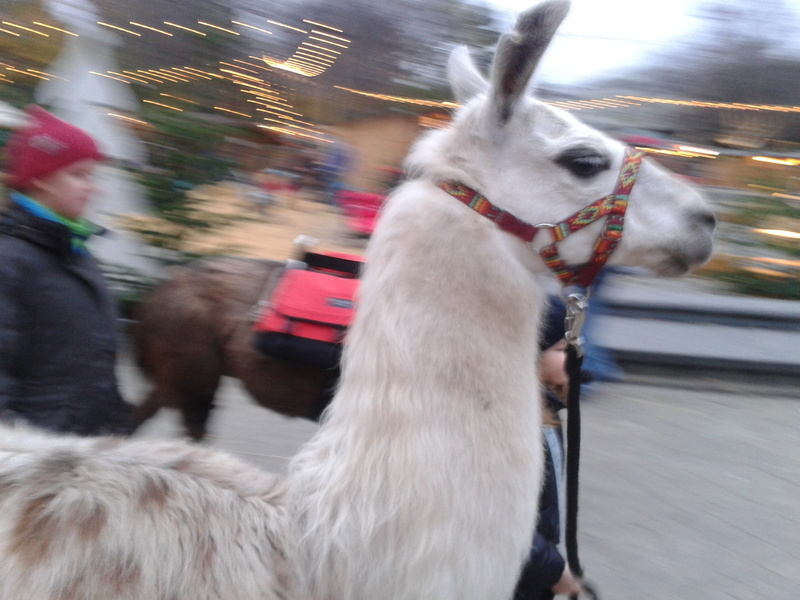 Yesterday I was at the Karlsplatz Christmas market, right in front of Karlskirche church and it was there I discovered it is the best place for lamas. No, I hadn’t had too much mulled wine, there were actually lamas being led around. They were part of the ‘attractions’ for kids, because this market is probably the best one for families. It has an area dedicated for kids, with animals, straw for them to play in and a little workshop for them to do crafts. Food and drink stalls circle this area and so parents can amuse themselves while keeping an eye on the kids. This market is also popular with locals who appreciate the crafts, ceramics and glassware on sale. Lovely atmosphere, lovely Gluehwein and lovely lamas. 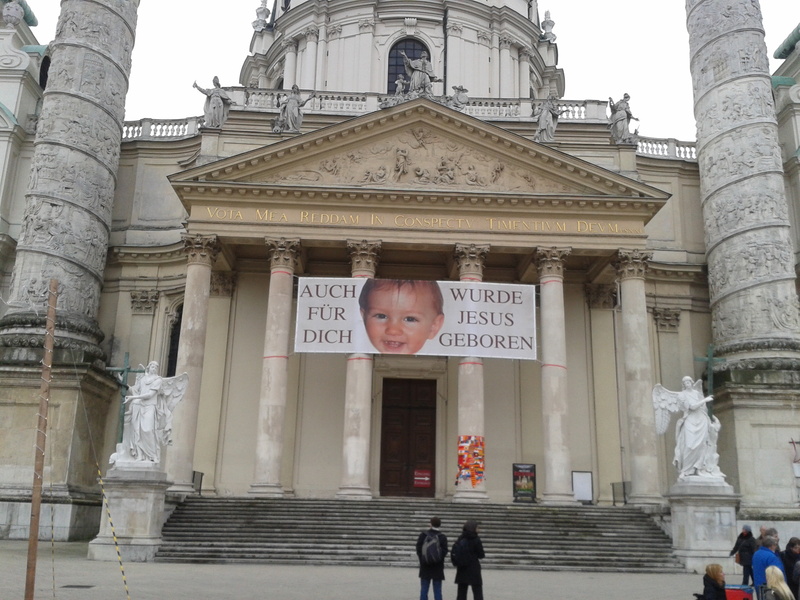 Oh and if you ever wanted to see a photo of the baby Jesus, this is the place to go. The market I will end on is my favourite one of all. 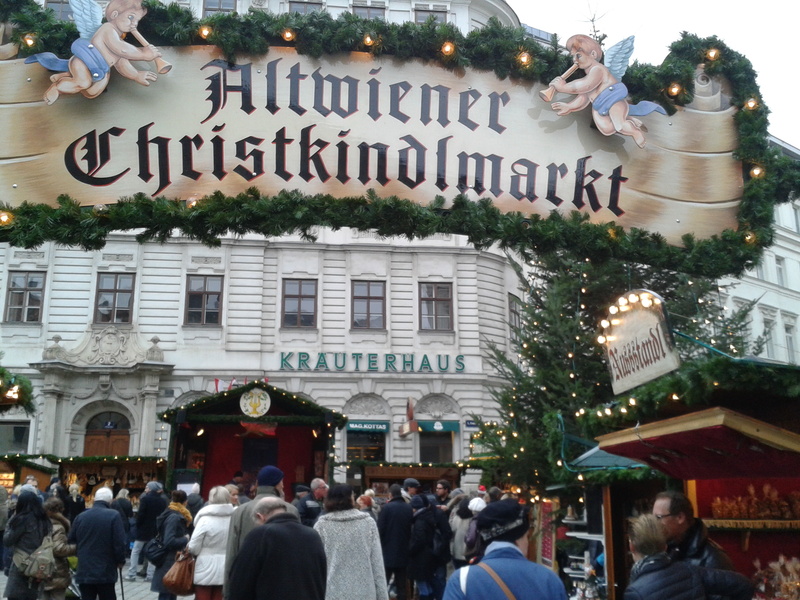 The Freyung market claims to be the oldest and for me it is definitely the most Christmassy. Freyung is a gorgeous little square which is beautiful at any time of year, but is especially magical at Christmas. It’s great for Christmas decorations and gourmet food products like mustards and honey. Even the Viennese give the Freyung market their seal of approval. There are many more markets around the city, which I will try and review within the next few weeks. Until then enjoy the hot booze, the hot chestnuts and the lovely lamas.